Student Michigan Pharmacists Association (SMPA) is an affiliated chapter of MPA, representing students at Michigan's three colleges of pharmacy in Michigan: Ferris State University College of Pharmacy, the University of Michigan College of Pharmacy and the Wayne State University Eugene Applebaum College of Pharmacy and Health Sciences. Congratulations on starting your career as a pharmacist on the right foot with SMPA membership. As an SMPA member, we’ll keep you up-to-date on what’s happening in the pharmacy world so you can focus on what’s really important: getting your degree! If you have any questions about SMPA, please contact MPA Chief Operations Officer and staff liaison Dianne Malburg at (517) 377-0223 or MPA Director of Membership Mike Wolf at (517) 377-0231. What can I expect from Student MPA membership? Free MPA publications sent right to your inbox! You'll receive the MSHP Monitor, a monthly publication from the Michigan Society of Health-System Pharmacists that features residency topics, information on MSHP events that are often complimentary to students and other information that's pertinent to health-system pharmacy. What can I expect after I graduate? After surviving four years of pharmacy school (you can do it! ), don’t think that we forget about you. Once you graduate, MPA offers FREE membership through the end of your graduation year. MPA also offers exclusive New Practitioner discounts to recently graduated SMPA members for up to five years after graduation. Student membership is important, but once you graduate, MPA membership is critical to your success as a pharmacist! For more information on what to expect after graduation, please see the student to new practitioner toolkit. What is the Student Pharmacist Executive Council? Established in 2012 after an amendment to the MPA Bylaws was approved, the Student Pharmacist Executive Council communicates actions of the Association to students at each college of pharmacy. The group also communicates the will of the students at each college to the MPA Executive Board, promotes engagement of students in the Association, and promotes community service with the collaborative participation of student pharmacists, pharmacy technicians and pharmacists. 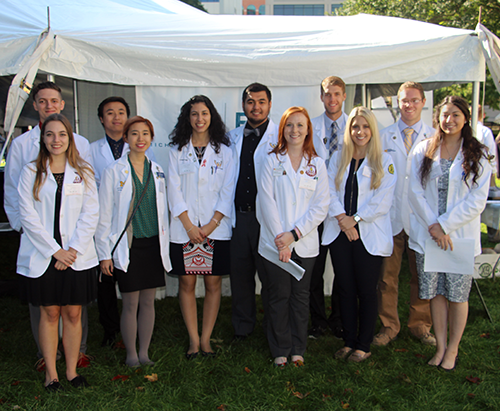 The Council consists of three students from each college of pharmacy in Michigan. The chairman and vice chairman are elected by the other representatives serving on the Council. In addition, the chairman serves as a voting member of the MPA Executive Board. If you have any questions regarding the Student Pharmacist Executive Council, please contact Dianne Malburg, MPA staff liaison, at (517) 377-0223 or Dianne@MichiganPharmacists.org. Click on the black bars below to access additional resources for student pharmacists. The cost of your education depends on where you enroll, distance to your hometown and the extent to which public dollars are used to support the pharmacy institution. Whether you're researching pharmacy education, or already enrolled as a student, utilize the links below for information on ways to help fund your education. Ferris State University (FSU) student pharmacists can contact student services for information about financial aid opportunities. Call (231) 591-3972 or visit the FSU website. University of Michigan (U-M) student pharmacists can contact the Financial Aid Office at U-M. Call (734) 615-6326 or visit the U-M website. Michigan Pharmacy Foundation (MPF), an affiliate of Michigan Pharmacists Association (MPA), offers a scholarship to one P2 or P3 student at each college of pharmacy in Michigan annually. Applications are due Oct. 15 of each year. Visit the MPF website for additional information or contact Dianne Malburg, MPF executive director, at Dianne@MichiganPharmacists.org.